CHANGE SUMMARY: Carbon monoxide alarms now require connection to the house wiring system with battery backup. Exterior work such as roofing, siding, windows, doors, and deck and porch additions no longer trigger the carbon monoxide alarm provisions for existing buildings. An attached garage is one criterion for requiring carbon monoxide alarms, but only if the garage has an opening into the dwelling. A carbon monoxide alarm is required in bedrooms when there is a fuel-fired appliance in the bedroom or adjoining bathroom. Carbon monoxide detection systems only require detectors installed in the locations prescribed by the code and not those locations described in NFPA 720. 2015 CODE: R315.1 General. Carbon monoxide alarms shall comply with Section R315. R315.1.1 Listings. 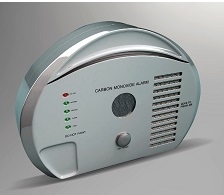 Carbon monoxide alarms shall be listed in accordance with UL 2034. Combination carbon monoxide/smoke alarms shall be listed in accordance with UL 2034 and UL 217. R315.2 Where Required. Carbon monoxide alarms shall be provided in accordance with Sections R315.2.1 and R315.2.2. R315.1 Carbon Monoxide Alarms.R315.2.1 New Construction. For new construction, an approved carbon monoxide alarms shall be installed outside of each separate sleeping area in the immediate vicinity of the bedrooms in dwelling units within which fuel-fired appliances are installed and in dwelling units that have attached garages. provided in dwelling units where either or both of the following conditions exist. 1.The dwelling unit contains a fuel-fired appliance. 2.The dwelling unit has an attached garage with an opening that communicates with the dwelling unit. R315.3 Where Required in Existing Dwellings.R315.2.2 Alterations, Repairs, and Additions. Where work alterations, repairs, or additions requiring a permit occurs in existing dwellings that have attached garages or in existing dwellings within which fuel-fired appliances exist, or where one or more sleeping rooms are added or created in existing dwellings, carbon monoxide alarms shall be provided in accordance with Section R315.1. the individual dwelling unit shall be equipped with carbon monoxide alarms located as required for new dwellings. 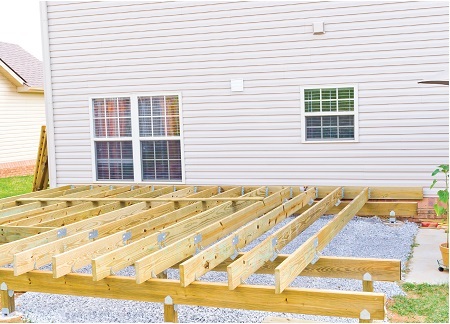 1.Work involving the exterior surfaces of dwellings, such as the replacement of roofing or siding, or the addition or replacement of windows or doors, or the addition of a porch or deck, are exempt from the requirements of this section. 2.Installation, alteration, or repairs of plumbing or mechanical systems are exempt from the requirements of this section. R315.3 Location. Carbon monoxide alarms in dwelling units shall be installed outside of each separate sleeping area in the immediate vicinity of the bedrooms. Where a fuel-burning appliance is located within a bedroom or its attached bathroom, a carbon monoxide alarm shall be installed within the bedroom. R315.4 Combination Alarms. Combination carbon monoxide and smoke alarms shall be permitted to be used in lieu of carbon monoxide alarms. R315.5 Power Source. Carbon monoxide alarms shall receive their primary power from the building wiring where such wiring is served from a commercial source, and where primary power is interrupted, shall receive power from a battery. Wiring shall be permanent and without a disconnecting switch other than those required for overcurrent protection. 1.Carbon monoxide alarms shall be permitted to be battery operated where installed in buildings without commercial power. 2.Carbon monoxide alarms installed in accordance with Section R315.2.2 shall be permitted to be battery powered. R315.6 Carbon Monoxide Detection Systems. Carbon monoxide detection systems shall be permitted to be used in lieu of carbon monoxide alarms and shall comply with Sections R315.6.1 to R315.6.4. R315.6.1 General. Household carbon monoxide detection systems shall comply with NFPA 720. Carbon monoxide detectors shall be listed in accordance with UL 2075. R315.6.2 Location. Carbon monoxide detectors shall be installed in the locations specified in Section R315.3. These locations supersede the locations specified in NFPA 720. R315.6.3 Permanent Fixture. Where a household carbon monoxide detection system is installed, it shall become a permanent fixture of the occupancy and owned by the homeowner. and shall be monitored by an approved supervising station. R315.6.4 Combination Detectors. Combination carbon monoxide/smoke detectors shall be permitted to be installed in carbon monoxide detection systems in lieu of carbon monoxide detectors, provided they are listed in accordance with UL 2075 and UL 268. CHANGE SIGNIFICANCE: The carbon monoxide alarm provisions in Section R315 have been reorganized to clarify their application. For example, the carbon monoxide detection system provisions have been placed in a separate Section R315.6 following all of the carbon monoxide alarm provisions in Sections R315.1 through R315.5. In addition, new charging sections have been added to clarify the scope and make the provisions easier to locate. Several technical changes have also occurred. The carbon monoxide alarm provisions have been rewritten to generally align with the smoke alarm provisions. For example, connection to the house wiring system with battery backup is now required for carbon monoxide alarms installed in new dwellings. Previously, the code only referenced compliance with UL 2075, which permits battery-operated, plug-in, or hard-wired alarms. Battery-operated carbon monoxide alarms are still permitted for satisfying the requirements in existing buildings, matching the revised provisions for smoke alarms. When work requiring a permit occurs, alarms must be installed in the locations prescribed by the code, but hard wiring is not required. New to the 2015 IRC, exterior work requiring a permit, such as roofing, siding, windows, doors, porches, and decks, does not trigger the retroactive carbon monoxide alarm requirements. This language mirrors the exemption in the smoke alarm provisions. Unlike the smoke alarm provisions, when two or more carbon monoxide alarms are required, interconnection of the alarms is not required. The carbon monoxide alarm provisions are only in effect when the dwelling contains fuel-fired appliances or has an attached garage. A malfunctioning fuel-fired appliance, such as a gas-fired furnace, water heater, or fireplace, is the most common cause of carbon monoxide poisoning in homes. Automobile exhaust migrating into the home from an attached garage is the other hazard addressed by the code requirements. Because the hazard of carbon monoxide gas from a garage depends on an opening between the garage and the dwelling unit, typically a door in the common wall, the code now only addresses garages with openings into the dwelling. Attached garages that do not communicate with the house do not trigger the carbon monoxide alarm requirements. The code requires carbon monoxide alarms to be installed outside of each separate sleeping area in the immediate vicinity of the bedrooms to protect people when they are most vulnerable to the effects of carbon monoxide poisoning—when they are sleeping or not fully alert. The 2015 IRC requires an additional alarm to be located in the bedroom when a fuel-fired appliance is installed in the bedroom or the adjoining bathroom. The IRC allows fuel-burning appliances to be installed in bedrooms and bathrooms, but this is not a common practice. When one is installed, the new requirement intends to provide early warning to protect occupants who sleep with their bedroom door closed from a potential source of carbon monoxide poisoning within the space. New provisions specifically permit the installation of combination carbon monoxide and smoke alarms complying with the applicable standards. Combination alarms are commonly installed outside of bedroom areas in residential construction as an acceptable method for satisfying both the smoke alarm and the carbon monoxide alarm provisions in the IRC, and this change simply recognizes a method that is already in practice. As an alternative to the individual carbon monoxide alarm requirements, the code permits the installation of a carbon monoxide detection system installed in accordance with NFPA 720. These systems have separate detection devices installed in the same required locations as carbon monoxide alarms. Carbon monoxide detection systems become a permanent fixture of the dwelling unit and are owned by the homeowner as prescribed in the code. This provision intends to avoid systems that are leased to the homeowner by an alarm company, and could subsequently be removed by the alarm company if the homeowner discontinued service, leaving the home with no protection for detecting rising levels of carbon monoxide gas. The permanent fixture and ownership provisions remain in the 2015 IRC. However, there has been confusion regarding the requirement for systems to be monitored by an approved supervising station, and this requirement was considered difficult to enforce. Proponents reasoned that a system that provides local alarm notification satisfies the intent of the code to provide early warning to occupants of increased levels of carbon monoxide gas and that it was difficult to justify the extra costs associated with monitoring by a supervising station. The code does not prohibit monitoring, but it is now an option rather than a requirement. 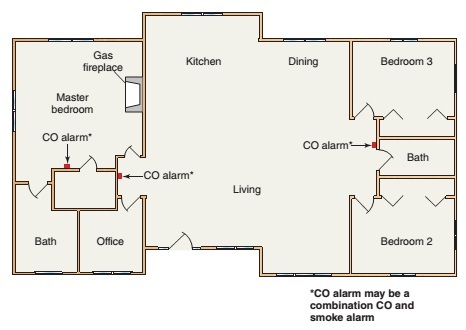 Language has also been added to the detection system requirements to clarify that the detectors only need to be installed in locations specified in Section R315.3, outside of each separate sleeping area in the immediate vicinity of the bedrooms, not in all of the locations specified in NFPA 720. Exterior work, such as a deck addition or re-siding, does not trigger the carbon monoxide provisions.